Baby it’s so HOT outside! And my COMPLEXION is not seeing perfection. My pores hate me and appear to be the size of swimming pools and my skin is pretty shiny in some areas and tight in others. How about you? I have always LOVED doing a form of Cryotherapy since I was a little girl! Only the treatment had not come out yet and entered the beauty universe. Here’s how I did it. When it is hot like this I take water fill an ice cube tray and freeze them. If you want to add fruit or flowers inside before you freeze them…go at it. It makes them prettier too! Next your freshly clean face is ready for a cooooool delight.I apply an ice cube (I sort of warm up a few seconds in my hand so no freezer burn face) Roll around and go up and down. I do not do the eyelid. This icy treat will chill you down quick! If you are hot on the neck and breast area roll a fresh cube there too.Use until you are done with the cube or save to use another time in a bowl in the freezer. Using ice cubes will tighten your skin and pores, refresh your skin and cool you down. Follow this ice cube treat with a HYDRATING tall glass of water with fresh mint (spearmint or peppermint) and fresh lemon slices. The key here is not to drink it iced much or no ice at all.The digestive tract does not like REALLY ICED water or drinks. In order to detox your system from all the sweet drinks and coffee you had all week. TRY this room temperature way. In the winter we will try something else but this is great for our bodies especially nowadays in this summer season.Skip a plastic straw that’s what I do… however,I’ve discovered the beauty of paper straws and reusable straws. The lemony with a hint of mint water is a nice refreshing way to drink water and I love to serve it to my husband,family and when company comes over. ENJOY! What’s in my handbag you ask? Business got in the way yesterday so I am posting this today. Many of you are curious what is in my handbag? So since this week we celebrated National Handbag Day… I decided it was the perfect time to share away. First of all, I am not necessarily attracted to designer handbags. I purchase handbags like I do bling.I buy what calls out to me on the store shelf. I especially love buying things in my travels so I have a great memory attached to that bag. I used to buy souvenirs like coffee mugs and tea towels but I stopped that long ago. So as you can see by the photo in my blog I HAD to own this unique handbag. Isn’t it darling? No, I did not pay a fortune but would have and it does not hold a lot of things but I do love,love, love THIS shoulder strap bag. Don’t you? A mini hairbrush by WET BRUSH…my hair tangles fast and I love this brush. A mini packet of NeoCell BEAUTY supplements they vary from time to time but this week it is Derma Matrix. I add it to a bottle of water or sprinkle on my food for pretty healthier hydrated skin. Six assorted shade lipsticks. Cause I never know what mood I am in during a day. A pack of Asian powder papers to blot oil and powder my nose at one time. My wallet with red lips by Betsy Johnson. My change purse with lips all over it. A Sharpie Marker in black and in red. A picture of my TWIN brother and my husband. A mini pill box filled with aspirin,vitamins C and more. A package of spearmint gum. A business card holder filled with my cards. A mini bottle of water if it will fit. I clean out my purse at least once a week. I hate a MESSY inside handbag. Stay tuned to The Chat on http://www.firstcoastnews.com on NBC12 and ABC25. Just a click away on VIDEO clip! Baby it is so COLD outside. Isn’t it? Our weather wreaks havoc on our face,body and health. Let me share with you how to feel better in this weather and share a skin moisturizing D.I.Y. too! ZIM’S Petroleum-free vapo rub is excellent to suppress an annoying cough due to drier weather and cold season and is used on your chest for coughs and colds. WARMS you up and makes you cough less and feel better.Hot tea,drinking water and eating chicken soup work alongside this too. Moisturize your face,lips and body and hair too! Applying face hand and body lotion is a must! You can use store bought brands or you can make it yourself! CeraVe moisturizing lotion or cream is filled with ceramides and hyaluronic acid and is recommended highly by dermatologists.It offers advanced skin care without a prescription. Also has NO fragrance and gentle enough for sensitive skin. Zim’s Crack Cream is an herbal skin cream for dry cracked skin. Made with aloe vera and arnica. Use on cuticles,elbows,knees and feet. Have flyaway hairs and static?Try rubbing a dryer sheet in the palm of your hands and on direct on your hair recommends my hairdresser John Brent from Chocolate Blonde Salon. OR you can make this D.I.Y. Recipe for making a Lavender Skin Smoothie:Whip up some organic coconut oil in a glass bowl. Add a couple of drops of lavender essential oil.Mix again. Place in a pretty jar and smooth up your dry skin and watch your skin drink it in. Recipe will last a few weeks in a tightly sealed jar.Great for the whole family! By the way if you do not like this essential try peppermint or rose or another. I LOVE sharing recipes and new and old time beauty secrets with you. Enjoy! Removes Your Makeup with just Water! I found something that you eco friendly girls like me would LOVE too. It is called the Makeup Eraser. The box first caught my eye. Shaped like an old school eraser.Too Cute! No more buying cotton pads and oily eye and face makeup removers. 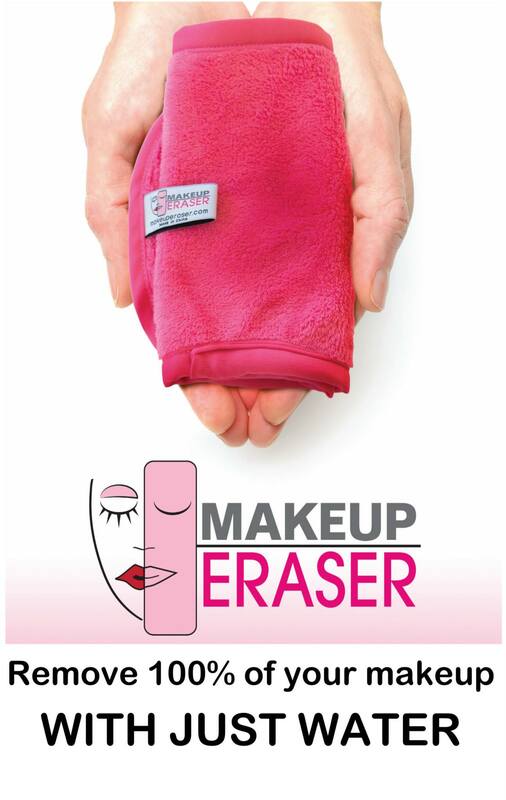 This super soft cloth removes makeup with warm water. Waterproof mascara removed in seconds. All natural no chemicals. Machine washable. No stains remain.Can be used over and over. The other side gently exfoliates.Promotes healthy skin.